Happy Wednesday, friends! I knew that although coming back to school after Christmas break would be hard, my kiddos and I would find our groove quickly - and I was right! It was so nice to come back and be in my "school-home" again. We are reading to roll into a great new year! Back in September, I made some BIG changes in my classroom.. 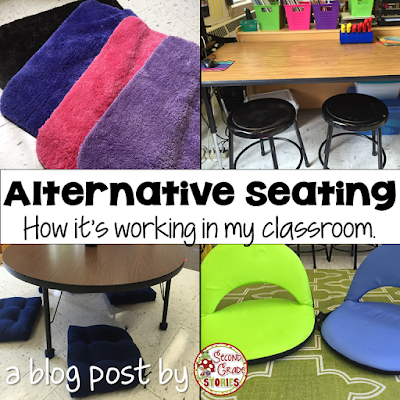 I had been reading about alternative seating and its benefits and was ready to try it with my second graders. Here we are now in January and I am sooo glad I did it! There's been lots of talk again lately about changing to alternative seating. 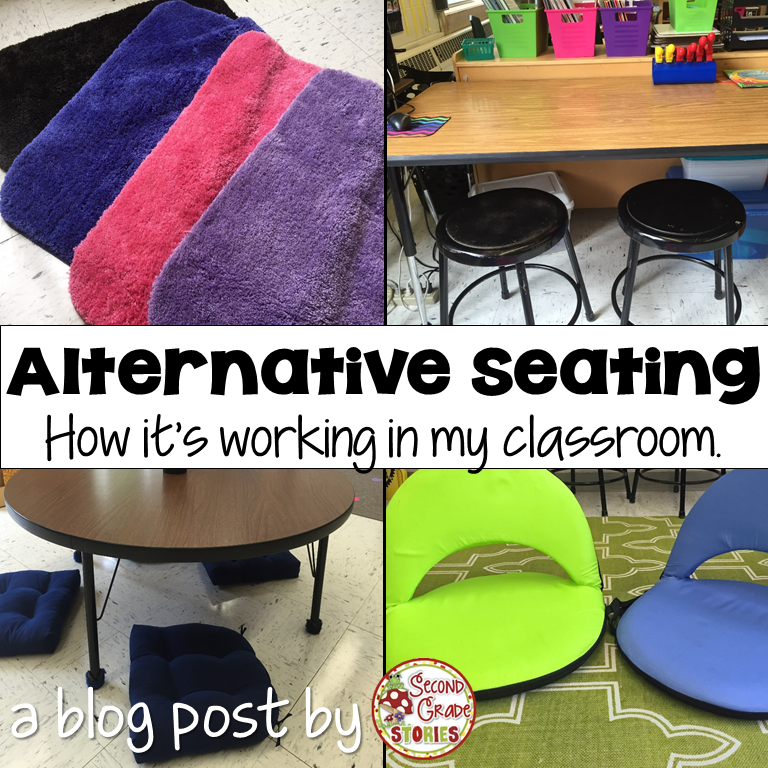 In October I wrote a blog post for ITeachSecond sharing the ups and downs of alternative seating in my classroom after the first 6 weeks of school. I have decided to share that same post here, in hopes of reaching more of you who are thinking about making the switch. Today I'll be sharing my original post from October. Later this week I'll be back with answers to some of my most asked questions about alternative seating. The best advice I can give - try it! I really started thinking about alternative seating earlier this summer after reading research about how important it is for students to have input and choice in where they work in the classroom. I know I prefer different work spaces depending on what I'm doing. When I'm planning, I'm usually spread out on the floor of my living room. Creating TpT resources requires a quiet environment with my laptop on a table. Curling up on the couch is my favorite way to read a book. I know that I'm more productive when I'm comfortable - why wouldn't the same be true for my students? That being said, since this was going to be something I TRIED - and wasn't completely sure about! - I didn't want to invest money is seating that wasn't going to be used. I was determined to use what I could find and borrow, but was willing to spend a little money to make it work. I also knew that I was going to have to put some clear guidelines in place to make this work. "I like being able to choose where I sit to work. I can sit where it works best for me." "I sit in different places for different things. I like to write with a clipboard in a camping chair, but I like to read sitting in a regular chair." "Choosing our seating makes us responsible." "It's important to have a comfortable place to work and everyone is different." Let's take a tour of my classroom and I'll show you my seating choices and let you know how each one is working with my kiddos. We'll start with an overall view of my room - from the front, side and back. You can see it's pretty open. That's what I wanted. There are different seating choices throughout the room. Here's a look at each type of seating in detail. This was my first idea for alternative seating. Thanks to Greg at Kindergarten Smorgasboard for the idea! I got four bath mats from Target and WalMart. I didn't get the cheapest ones because they seemed thin and I was afraid they would wear quickly. I also chose colors that wouldn't show dirt too quickly. The bath mats are a definite hit! They are easy to take out and clean up, can be put anywhere in the classroom and more than one student can sit on each one. Not many negatives for these! The only issue is while they are better than working on the floor, some of my kiddos still find it uncomfortable after a while. This was an easy one to switch out. I replaced the two chairs I used in that space with stools. (I had used these stools in my room last year for my listening center. I spray painted them black last year.) The table is put at regular height. This is a great "in between" way to start alternative seating - regular table, different seats. It's simple and easy. The stools can be pushed under the table at the end of the day and stacked to the side when we're done. This has worked really well, too! Only problem - some of my kiddos tend to fall off :-) We did a quick mini-lesson on how to correctly sit on the stools. Next up - the low table and cushions. I took the legs off of this table and placed it directly on the ground. The cushions are chair cushions from WalMart. I know kids love sitting on the floor to work, so I figured this one would be a hit! The idea was great. My kiddos loved sitting on the floor and working at the table. That's about it for the good part, unfortunately. This table is currently at regular height again, with stools. Even without the legs the table was too high for my second graders to be able to comfortably work while sitting on the floor. Some tried kneeling while they worked, but it wasn't very comfortable. Even my tallest kiddos has trouble with it. I really want this alternative to work so I'm playing with the idea of making my own table and putting it on wooden blocks or something so it is the right height. I got these chairs from Amazon (link HERE) after seeing a similar one on a Periscope from Meg at Meg's New Box of Crayons. A little pricey, but I knew they would work. They could be washed off and wiped clean, were easy to move around the room, and they are adjustable to different angles. Winner! I wish I could afford more of these seats :-) They are very comfortable, portable and give great back support, which is important for kids to be comfortable. They are without a doubt the favorite seating choice in my room. Not really a negative, but the fact that they adjust meant we had to talk about putting the chair in one position and leaving it there while you work. No making "click click" sounds all the time and not getting anything done! I knew if some of my kiddos were like me, they were going to want to spread out when they worked. I always have an open rug area in my room, so this was a no-brainer. (I also have another smaller rug area in the back of my room.) The one thing I did differently was to place the rug in the middle of the room, rather than in a corner. The rug was already there - no cost! 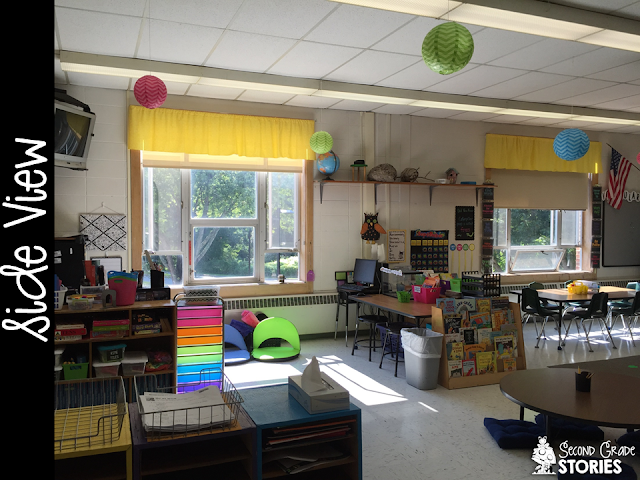 It's a great area for kiddos to spread out, or work in small groups. None. 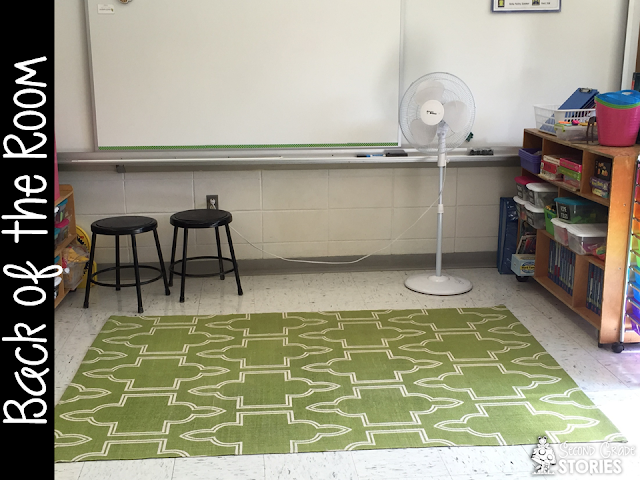 I do encourage my kiddos to use seating like the bath mats and picnic chairs on the floor, rather than on the rug. That way more students have a place to work that is not on the cold tile. This was as close as I was getting to a standing table. I couldn't afford to buy another piece of furniture, and the counter top is the perfect height for second graders. They can work right on the counter, or grab a clipboard. There is a table in front of the counter, which I thought might be good if they needed extra space as they worked. For kiddos who prefer to work standing up, this is a great alternative. Again, it was already in my room, so there was no added expense, and it was the right height. This has not been a space that has been used much in my room. At first I thought it might be because there was too much stuff on the counter nearby. But even after clearing a more open space, none of my kiddos chose to work there. I asked them why this choice wasn't working - they all said they didn't like to work standing up. I'm thinking this may just be the make-up of my class this year. The good thing is the counter isn't going anywhere, so if things change later in the year, the choice is still there. The final seating choice in my room are my three camping chairs. I've had these for a couple years (I got them from Five Below). Prior to this, we used them as a special treat for independent reading. They are always in demand, so I knew they would be a popular choice this year. I already had them, so nothing to buy. They can be easily moved anywhere in the room. They are comfortable and stable. Just grab a chair and a clipboard and you're ready to work! I can't really think of any negatives for these chairs. They are a very popular choice! They definitely work best for students who can work with a clipboard on their lap. There you have it! My experiment with alternative seating is no longer an experiment - I plan on keeping seating choices open for the year, and will do this next year, too! My students have become responsible for their learning choices and this has made them more invested in their day. The are quick to get started with their activities and are staying focused and engaged longer. 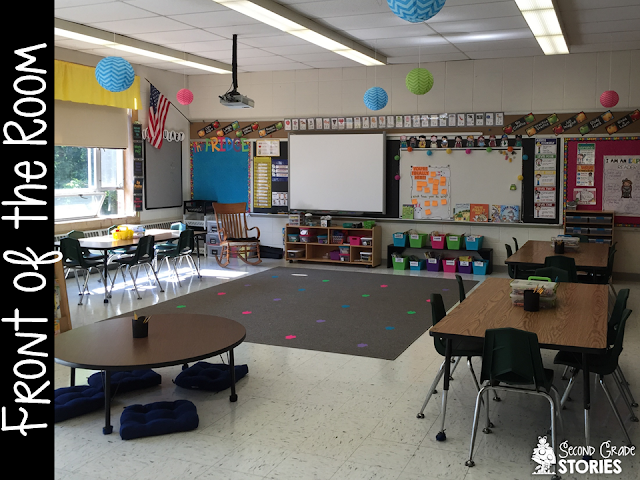 Have you thought about trying alternative seating in your room? I'd be happy to help you out by sharing my ideas and thoughts. 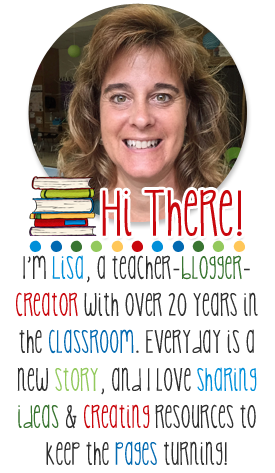 Leave a comment, or you can email me at secondgradestories@charter.net. Start small! Look around and see what you have available and how things can be repurposed. Then go for it! If it doesn't work, you can always go back to a traditional seating plan. But I bet you'll find at least something that you love about alternative seating - and most importantly, so will your students! I was really excited to stumble upon your blog post! I've been heavily considering having alternative seating available for students in my classroom. I appreciate how you listed pros and cons of each item! That was really helpful. I would ideally want to have alternative seating next year, but I often get so excited with ideas for the following year that I have to 'test run' them towards the end of the school year! I'm planning on designing a Project Based Learning project with "What classroom environment do students learn best in?" as the driving question. I'm going to have my students research different types of seating, tables, & tools to stay active while sitting. They are also going to research health benefits associated with 'not sitting all day'. They'll work in groups and be given a budget to work with. They'll design their area of the classroom and choose which seats/tables/etc would work best in that area & include them in their design. They'll create a model of their design however they choose to and write persuasive pieces to encourage others to donate/help purchase the items in their design. I'm planning on submitting them on Donors Choose, putting them through the PTA, etc. This project would fit perfectly with our units of study (measurement, money, economics, persuasive writing). I'm trying to find some "experts" in alternative seating that my second graders could speak to about having alternative seating in the classroom. This wouldn't be until later on this spring. Would you be willing to speak with my students about how this has worked in your classroom? Could our students speak to one another about their classroom via Skype? Just let me know! I appreciate any help you could give us! Thank you again for your helpful blog post! I am hoping to do flexible seating in my music classroom this upcoming year, so this post was very helpful!! Thanks so much for the great info! How do you do whole group lessons? Where do the students sit? Thanks so much for sharing your ideas! I am expanding on my flexible seating this year so I really appreciate your insight. The pros and cons are really helpful too! I have 28 kids with double desks. I'd love to have flexible seating. My question is where do you keep all the stuff for each kid? Their workbooks, spiral, journal, writing notebook all need to be stored. I use flexible seating in my 1st grade classroom. I have students keep their journals and books in those little plastic storage drawers you can get from Walmart (https://www.walmart.com/ip/Sterilite-3-Drawer-Desktop-Unit-White-4pk/44785782). I have one per student. Another teacher in my school uses the larger ones and has 2 students share a drawer (https://www.walmart.com/ip/Sterilite-3-Drawer-Wide-Cart-White/8282897). I keep mine against the wall but the other teacher keeps them near the tables. My students only need have 2 journals, a spiral, 2 folders, and no more than 4 books. These supplies fit perfectly in the small drawers. It really depends on what you need for your kids. Each of my students also have a bucket (http://www.hobbylobby.com/Party-Baking/Themed-Party-Collections/Baby-Shower/Blue-Small-Bucket-with-Handle/p/54153) where they keep their crayons (in soap boxes), pencils, scissors, and glue. This seems to take care of any supply storage I need. I also know of another teacher who uses flexible seating and uses community supplies and just has a plastic crate full of journals with the students' numbers on them so she doesn't need any type of drawers. Thank you so much for the great ideas!! I really loved the pros and cons for each type of seating choice. One question...where do they keep their supplies, backpacks, and folders? I am starting flexible seating next year. My students have "special drawers" to house their odds and ends. We use chrome books for many activities and house any text books in a central location. The drawers are the ten drawer rolling cart often sold in craft stores. I have used various forms of seating but next year I am adding the standing station. Ok I have a small classroom with desk and 3 tables, no extra storage space. Where do you keep everything? What about students supplies and books?